Let's be real — the filling is the best part of an Oreo! 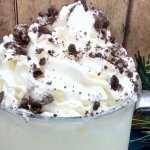 We've taken that rich cream filling and created a luscious Oreo White Hot Chocolate that's guaranteed to warm you up on a cold winter day! Add liquid ingredients (milk, sweetened condensed milk, vanilla, and cookies & cream syrup) to a large saucepan over medium heat. White pan heats, remove the filling from your Oreo cookies and add the creme filling to the ingredients in pot. Set cookies aside for later. Add white chocolate chips to pan. Whisk ingredients in saucepan as the liquid heats — until the mixture is hot, but not quite boiling and the white chocolate chips are completely melted. Pour steaming white hot chocolate into mugs and top with a generous dollop of whipped cream. Finish with crumbled Oreo cookies.